Last year, a photo of toddler Alan Kurdi’s body on a Turkish beach evoked a global reaction to the plight of Syrian refugees. The business community was quick to respond, donating an unprecedented $17 million to refugee aid in one week. Perhaps more striking than the scale and speed of corporate contributions is that they increasingly go beyond cash. Forward-thinking companies now look to bring their core capabilities to a humanitarian crisis, and are laying the groundwork to do so by establishing partnerships before crises hit. Many of today’s crises combine economic, social, political, and environmental conflict, warranting the label “complex crises.” These interconnected issues may exceed what traditional humanitarian organizations can address. Complex crises also carry significant implications for businesses and economies, often motivating private sector involvement. While committing to support a crisis is a big decision for a company, determining how to contribute beyond financial donations is even more daunting. This article looks at how companies are teaming up with humanitarian organizations to address complex crises. It draws on 30+ interviews with companies, humanitarian organizations, and academics, and is part of ongoing research by the World Economic Forum and Deloitte to improve the assistance provided to those impacted by crises. The humanitarian organizations interviewed made it clear that when companies choose not to collaborate, it may actually be counterproductive to crisis response efforts. For instance, the donation of unnecessary and unrequested supplies, known as Unsolicited Bilateral Donations, can lead to supplies going unused and clogging up main transportation channels. Interview participants often find projects to be an ideal way of experimenting with new partners, with 75% of businesses interviewed engaging in them. Companies cite flexibility as a major advantage of this form of partnership. A project can be tailored to the conditions of a specific crisis, and concluded once the desired outcome is achieved. When these collaborations are successful, they can be adapted to fit the needs of a new crisis. For example, Coca-Cola recognized an opportunity to leverage its local relationships during the 2014 Ebola outbreak and embarked on a crisis-specific project. The company partnered with communications coalition Africa United on a public education campaign to halt the spread of Ebola. Africa United designed a messaging campaign across various mediums, including notebooks, posters and trading cards with celebrity soccer stars and public health messaging. The local Coca-Cola bottling partner supported printing and distribution of the materials to NGO partners for use in broader education efforts. As partnerships with humanitarian organizations blossom, the desire to widen the circle of collaborators and learn from others’ efforts leads to knowledge networks. Global logistics companies Maersk, UPS and Agility coordinate their crisis response efforts through the Logistics Emergency Team (LET), which supports the Logistics Cluster led by the United Nations World Food Programme. 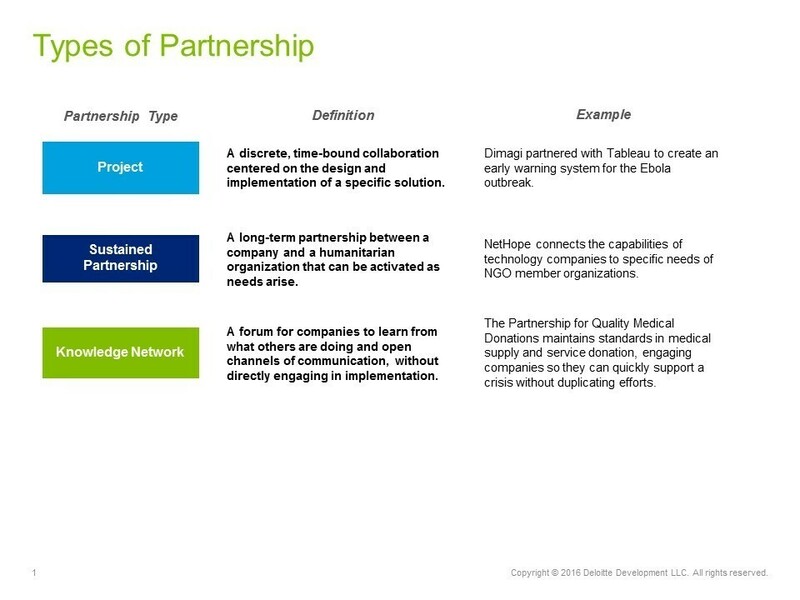 Each company has its own set of partnerships beyond the LET that can be activated to respond to a need. For instance, UPS has a partnership with Gavi, the vaccine alliance, and robotics company Zipline enabling it to deliver vaccines and blood via drone. When companies pool their expertise it can be a relatively light lift for each company that results in an outsized impact in the crisis. However, these networks are still in short supply, as only 20% of companies interviewed are currently active in one. Those that exist have struggled to scale beyond a few active members. More are needed, including ones that engage companies beyond the telecom, logistics, and health sectors currently served by existing networks. “We can’t be a global, multicultural company without contributing to global issues,” said Charles Mouzannar of Amec Foster Wheeler, an international construction company. Many global companies recognize that supporting complex crises is essential to their values and reputation. They also understand how it can mitigate business risks and support economic growth where they operate. As part of its MasterCard Aid Network, MasterCard partnered with Save the Children to provide chip-enabled cash vouchers to people affected by civil unrest in Yemen. This initiative reflects a long term commitment to financial inclusion that positions MasterCard to be a part of Yemen’s economic recovery. Contributing towards local employment and strengthening local communities have become priorities for companies like Amec Foster Wheeler that plan to work in fragile regions for many years to come, and want to draw from a strong local talent pool. A company’s ongoing role in a fragile region can also help stabilize the economic activity in the area, supporting the region’s resilience and recovery. During the Ebola crisis, Maersk worked closely with affected countries’ authorities to help make sure that Maersk-operated ports remained open, and that Maersk vessels continued to call on ports in Guinea, Liberia and Sierra Leone. These actions helped maintain the flow of essential supplies, and kept the costs of in-demand products lower than they might be otherwise. With more than 100 million people in the world affected by humanitarian crises, there is no better time for the private sector to strengthen its engagement. The private sector has proven itself to be a reliable and valuable partner, but the full scale of its potential is yet to be realized. Achieving meaningful, long-term impact starts with teaming with humanitarian partners on the ground long before a crisis arises. Consider how your company could be involved. Will you start with a project, engage in a sustained partnership, or join a knowledge sharing network? Companies of all types are rallying to address complex crises. Every company is invited to contribute and activate its business network to address these pressing challenges.